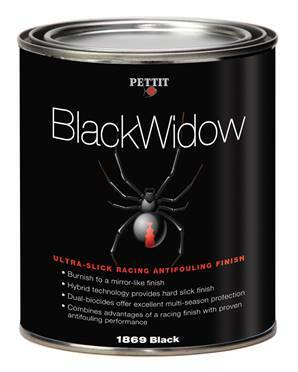 Pettit Marine Paint, leading manufacturer of high performance marine coatings, announced today Black Widow, the highest-performance racing finish, is now available. The slickest, fastest, ultra-smooth burnishable racing finish on the market, Black Widow is also a powerful dual-biocide bottom paint that provides multi-season protection in all waters. Easily applied by roller, brush or spray, and burnishable to a metallic “gun-metal” shine, Black Widow makes an excellent paint for the bottom of any boat where speed is the number one priority. Racing sailboats, bass boats, personal watercraft and high performance offshore powerboats and superyachts will benefit from Black Widow’s four strong slickening agents: Molybdenum Disulfide, Polytetrafluoroethylene (PTFE), Graphite and Silicon – all powerful lubricants that reduce drag. 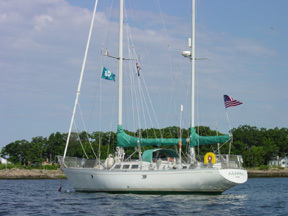 This translates into greater speeds and lower fuel consumption. The durable coating resists the elements and the slick finish is easy to clean. Black Widow is available in gallon cans for $279 from fine marine supply stores and boatyards throughout the United States.